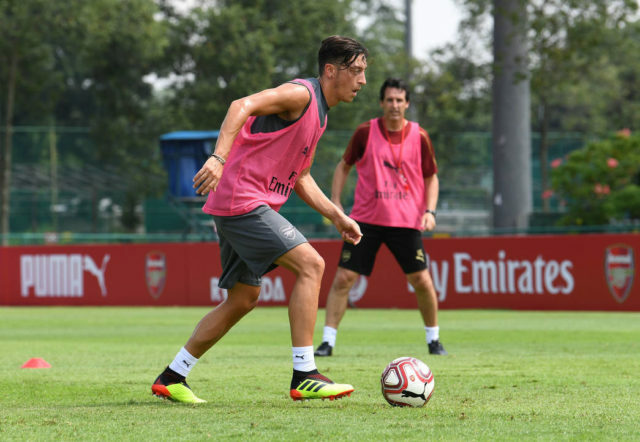 Germany’s football association (DFB) has “emphatically rejected” allegations of racism from Arsenal’s Mesut Ozil but says it could have done more to protect him from abuse. Ozil, 29, announced his retirement from international football, citing “racism and disrespect” within German football. The midfielder says he received hate mail and threats, and was blamed for Germany’s disappointing World Cup. The DFB said it “regrets the departure of Mesut Ozil from the national team”. It added in a statement: “We emphatically reject the DFB being linked to racism. Ozil, a third-generation Turkish-German, was born in Gelsenkirchen and was a key member of his country’s 2014 World Cup-winning side. A month before Germany’s title defence, Ozil met Turkish president Erdogan along with fellow Germany international Ilkay Gundogan, the Manchester City player who is also of Turkish descent. Ozil says he and Gundogan talked about football with the president. Afterwards, photographs were released by Turkey’s governing AK Party in the build-up to elections in the country, which Erdogan won last month. Many German politicians questioned Ozil and Gundogan’s loyalty to German democratic values. Germany has previously criticised the Turkish leader’s crackdown on political dissent following a failed coup. He said Erdogan had also met the Queen and Prime Minister Theresa May while in England and said he would have been “disrespecting his ancestors’ roots” had he not posed for photographs with the Turkish president. “It wasn’t about politics or elections, it was about me respecting the highest office of my family’s country,” he added. Ozil has 92 caps and has been voted the national team’s player of the year five times since 2011 by fans. He said his recent treatment made him “no longer want to wear the German national team shirt”.